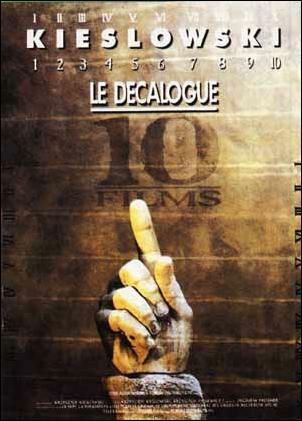 I think this one will be the most underrated of the Dekalog series Probably like the majority of people who will read this comment, I had been waiting years for the Decalogue to be released on video. I had seen and loved The Double Life of Veronique and the Three Colors Trilogy, and this was the next step that I thought I would never be able to take. But then they actually released it on DVD and I was ecstatic! I have been watching them one at a time every once and a while since I got the set last week. At this point, I have seen the first three. I would say that #1 is the best, and one of the best films I've ever seen. I couldn't imagine a better 53 minutes of film ever being made. But I found #3 to be very close. Like the first two, Dekalog 2 thrives on its extreme subtlety. I had to watch bits and pieces of all three episodes over again to understand it entirely (although I doubt I understand them entirely, I can tell that these will be films that I will watch many times in my life. A good thing, too, since they're only an hour long each!). And like the first two, #3 contained three lead performances that were no less than perfect (my God, each actor of the first three Dekalogs is so perfect!). Even the few bit parts in this episode (and the other episodes) were absolutely perfect. Watch the security guard at the station near the end of this episode. She comes roaring in on a skateboard and delivers the most perfect 1 minute performance I've ever seen in a film. To recount the story would ruin it. (By the way, I'd like to make a small complaint about the descriptions of the episodes on the boxes. They tell you the entire plot of each episode! If you have not bought it yet, when you do (and you really should) don't read these descriptions. Just make sure you read the commandments each episode signifies). What I would like to say, though, is that I think this one will be a very underrated episode when more people have seen these films. I have read every review I could find for them, and none mention #3 any more than in passing. I think if you pay very close attention, maybe watch it a couple of times, you'll see that this one can be ranked among the best films ever made, too.